Former Police Commissioner Khomotso Phahlane has described as ludicrous the fact that he is facing fraud and corruption charges as ‘accounting officer’ for the police and insists former IPID boss Robert McBride is pursuing a vendetta against him. Phahlane and others are facing fraud and corruption charges relating to the R86 million blue lights deal. Phahlane was speaking to Chriselda Lewis on the SABC News’ Unfiltered show. Meanwhile, McBride, who also appeared on the show, says he finds it very strange that former NPA boss Shaun Abrahams failed to act against Phahlane. Abrahams was removed by President Cyril Ramaphosa and replaced by Shamila Batohi in 2018. 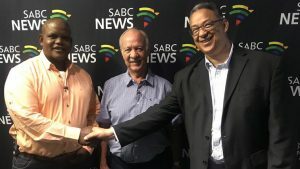 The post Phahlane describes fraud charges against him as ludicrous appeared first on SABC News – Breaking news, special reports, world, business, sport coverage of all South African current events. Africa's news leader..